As more and more districts give back their Race to the Top funds to protect student privacy, so they don't have to sign up for data dashboards that will be populated with personal data from the inBloom cloud, they also realize that this does not spare their student data from being uploaded by NYSED anyway. Commissioner King has been adamant that personal and highly sensitive data from the entire state's public school population will be shared with inBloom whether districts sign up for dashboards or not. See this comment from the School board President in Spackenkill NY, Arij Kurzum, upon returning these funds and turning down the dashboards, because it "was what people in the community wanted and the reaction seems favorable. 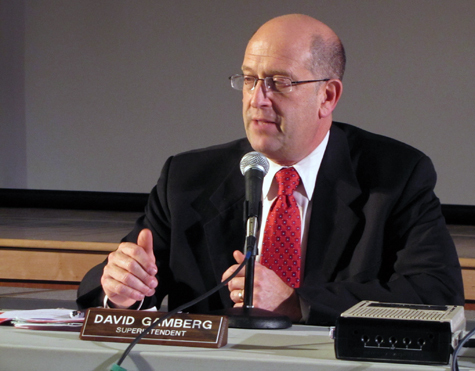 But see the letter written to inBloom by Superintendent, David Gamberg of Southhold LI, below. He identified a provision in the state's contract with the Shared Learning Collaborative (which later became inBloom Inc.) allowing districts to opt out -- despite what the state currently maintains. The relevant clause appears on page 9 of Exhibit C, of the Data Privacy and Security Plan, under the heading “District Opt out from SLI.” It states: “If a school district decides they no longer wish to use the SLI system, they may request that district student data be deleted from the SLI data store." The SLI stands for the Shared Learning Infrastructure, inBloom's data system. According to NYSED officials, this contract or "service agreement" has not been amended or updated since it was signed last year, and it is still posted at the SED website here. Other Superintendents should emulate Southhold's demand, and follow up with a lawsuit if inBloom does not agree to comply. I have to say, this is a fantastic development here on Long Island were very few superintendents have the courage to speak up. This is more than symbolic. This is forceful. Telling them, hey we're done, we want out and our concerns trump the state's is fantastic. Please continue to follow the updates on this from Southold. Way to go Mr. Gamberg! It's never to late to be a hero. READ THE CONTRACT!! The term EXPIRED 12/31/12!!!! We had this contract last week and after further review saw that the MOU term ended 12/31/12!!! PLEASE READ THIS THOUGH: NYSED HAS THE AUTHORITY TO REDISCLOSE DATA WITHOUT DISTRICT CONSENT!! This is encouraging. I hope more districts will follow in his footsteps! we've known that FERPA was revised in 2008 and 2011 to encourage disclosures and redisclosures of student data without consent. This has been written about many times. Moreover, if this part of the NYSED contract with inBloom is expired, then the entire NYSED agreement is null and void. That's my post up there ^ Leonie is absolutely correct- the deletion clause is valid! Those are almost considered to be right possible means and one had to think in accordance with such kind of probabilities and then to moving forward we would nearly be able to regard such more principles for the future.